U.S. District Court Judge Michael H. Simon this week lifted the requirement that NOAA Fisheries must complete its next iteration of a salmon/steelhead biological opinion for the federal Columbia River power system by December 31, 2018. Instead he said in his April 17 decision that if NOAA does not want to or cannot complete the BiOp by the end of this year, it can deliver the document any time up to March 26, 2021, the date the next BiOp is due. NOAA has yet to determine whether it will complete its next BiOp by the Dec. 31 date, or if it will set aside that BiOp and instead meet the March 26, 2021 deadline set by the court. Michael Milstein, NOAA spokesperson, said the agency is assessing the ruling. In 2016, Simon remanded NOAA's 2014 BiOp and set a schedule for federal agencies to replace it. The agencies charged with a National Environmental Policy Act process to replace the BiOp – the U.S. Army Corps of Engineers, Bureau of Reclamation and Bonneville Power Administration – said the process would require five years of public involvement and work, but along the way it would meet the prior schedule for a 2018 BiOp, complete an Environmental Impact Statement in 2020 and submit a new BiOp to the Court in 2021. Plaintiff in the case, the National Wildlife Federation, in its Jan. 22, 2018 brief to the court, said keeping the 2018 BiOp in the schedule would not be in compliance with NEPA and the federal Endangered Species Act. NWF suggested it would be appropriate to modify the current remand order to "eliminate the requirement for a new biological opinion by December 31, 2018, since Federal Defendants will not be preparing an EIS or other NEPA document to accompany such a BiOp. Consequently, any decision by the federal action agencies to adopt the proposed action or reasonable and prudent alternative ("RPA") in such a BiOp would violate NEPA and be contrary to the Court's decision." "Considering the unique facts and circumstances of this case, the efficiencies and benefits of the Section 7 and NEPA processes running concurrently (as previously conceded by the Federal Defendants), and the tentative nature of the Federal Defendants' originally requested remand schedule and the Court's original Order of Remand, the Court grants in part Plaintiffs' motion to modify the remand schedule," he wrote. "The Court extends the deadline for the next biological opinion from on or before December 31, 2018, to on or before March 26, 2021." Further explaining his order, he said that "NOAA Fisheries is thus under no court-ordered obligation to produce a biological opinion before the NEPA process is complete. If NOAA Fisheries chooses to issue the next biological opinion after December 31, 2018, the Court will at that time consider any motion for further appropriate relief relating to the incidental take statement and other related issues." NOAA Fisheries' BiOp sets "reasonable and prudent alternatives" intended to mitigate for impacts of the federal dams on 13 species of Columbia River basin salmon and steelhead listed as threatened or endangered under the federal Endangered Species Act. Subsequent recovery plans for each listed species outlines the standards for recovery and the actions required to meet them. NWF attorney Todd True had said in January that the NEPA process now underway would not result in a finished environmental impact statement on the federal Columbia River power system's impacts on threatened and endangered salmon and steelhead until 2021. Staying on the course set by the court to complete a BiOp by the end of this year, then, would be illegal because it would lack the backing of an EIS, he said. Simon, himself, had raised the question in a status conference in late November 2017. He had set the meeting to weigh the progress of the 5-year NEPA/EIS process required by his May 2016 order to redo the 2014 (and current) BiOp for Columbia Basin salmon and steelhead. At that Nov. 28 status conference, Simon acknowledged that the next BiOp would not have the foundation of a new EIS, asking that if the NEPA process will not be done by 2018, then "it would be best to dispense of the 2018 BiOp until we get to a point where we can operate under a sufficient EIS." He asked both plaintiffs and defendants in the case to offer their thoughts on the idea in January briefs. Until 2021, when the court-ordered BiOp is due, the system could continue to operate under the current 2014 BiOp, Simon added at the time. That could also mean that the system would operate with the additional court-ordered spring spill through 2021, although Simon did not weigh in on this issue in his Order this week. 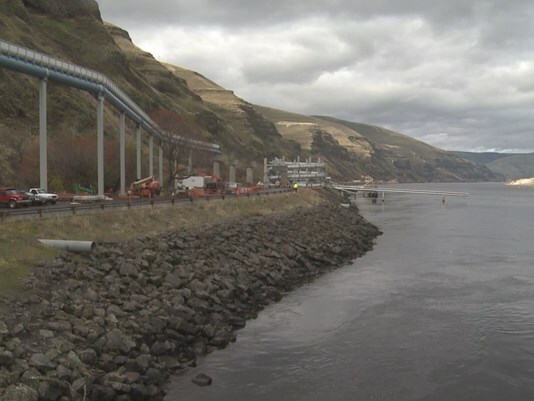 Court-ordered spring spill to the upper limit of total dissolved gas allowed by the State of Washington at four lower Snake River dams began April 3. Court ordered spring spill, also to gas cap limits, began at the four lower Columbia River dams April 10. Caps on total dissolved gas (caused when spill plunges into the river) are intended to protect young fish from gas bubble trauma during spill. Simon, in his Order, said that federal defendants in their briefing filed before the November hearing did not clarify the best way to integrate the 2018 BiOp and NEPA process or explain how the existing deadlines were the optimal way to move forward. "Plaintiffs, Oregon, and the Nez Pierce Tribe all expressed concerns that the 2018 BiOp would result in another violation of NEPA and requested that the Court modify the remand schedule," Simon wrote. "At the November 28, 2017 hearing, the Court tentatively agreed with that concern. A comprehensive EIS will not be issued until the NEPA process is completed in 2021. Accordingly, producing a 2018 BiOp creates a situation where the Action Agencies may violate NEPA in adopting the 2018 BiOp, just as they did in adopting the 2014 BiOp."